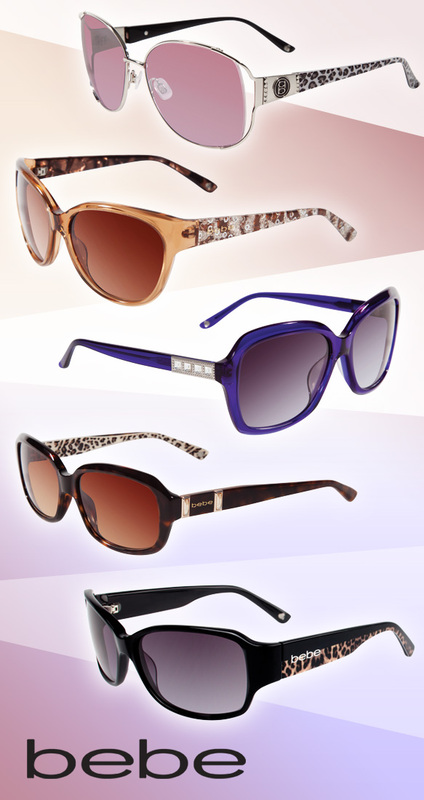 With glimmers of luxurious lace, twinkling sequins, sparkly crystals and fierce animal prints, bebe’s winter 2013 women’s eyewear line exudes trendy sophistication. The collection has arrived at the perfect time—the start of the New Year, when almost every gal is in search for a fabulous way to revamp her look! There’s no better way to do so than by glamorizing your peepers with bebe sunnies and specs. Made with shiny acetate and metal materials in colors like light blue, translucent amber and deep purple, these frames appear super lavish, especially because of the intricate temple detailing. You’re sure to look all dolled up for any occasion—work, play or relaxation—in these specs! Keep your eyes shaded in high-class style with any of these sunnies. There are various shapes, from chic cat-eyes to glam squares, to fit all kinds of faces. Frames and lenses in neutral hues and patterns, like silver, topaz, black and tortoise, work well with any outfit, whether it is casual or fancy. Meanwhile, more eye-popping colors, like bright purple and warm pink, will add unexpected vibrancy to your look.